Chronic kidney disease (CKD) is a critical and rapidly growing global health problem. Neurological complications occur in almost all patients with severe CKD, potentially affecting all levels of the nervous system, from the central nervous system (CNS) through to the peripheral nervous system (PNS). Patients with CKD exhibit a high incidence of symptomatic and occult cerebrovascular diseases, associated tremendously high levels of inflammatory factors and homocysteine, as well as anemia, hypertension, and diabetes. As these risk factors overshadow aging and nonvascular factors, CKD patients represent a potential model of accelerated vascular cognitive impairment. In this article, the disease-related and treatment-related neurological complications of renal disorders will be reviewed. Neurologic dysfunction may manifest as a direct consequence of the uremic state, its treatment, or both. Encephalopathy may be caused by uremia, thiamine deficiency, dialysis, transplant rejection, hypertension, fluid and electrolyte disturbances, or drug toxicity; symptomatic and occult cerebrovascular disease along with cognitive decline and/or dementia may occur associated with the presence of inflammatory factors, high homocysteine levels, anemia, hypertension, and diabetes; infections present as meningitis, encephalitis, myelitis, or brain abscess; movement disorders, osmotic myelinosis, neuropathy, thrombotic microangiopathy or treatment related adverse effects may also be seen. It is essential to diagnose and manage such neurological complications in patients with renal disorders. Chronic kidney disease (CKD) is a critical and rapidly growing global health problem. Neurological complications occur in almost all patients with severe CKD, potentially affecting all levels of the nervous system, from the central nervous system (CNS) through to the peripheral nervous system (PNS). Cognitive impairment, manifesting typically as a vascular dementia, develops in a considerable proportion of patients on dialysis, and improves with renal transplantation. Patients on dialysis are generally weaker, less active, and have reduced exercise capacity compared with healthy individuals. Peripheral neuropathy manifests in almost all such patients, leading to weakness and disability. Better dialysis strategies and dietary modification could improve outcomes of transplantation if implemented before surgery. Patients with CKD exhibit tremendously high levels of symptomatic and occult cerebrovascular disease and associated inflammatory factors, high homocysteine levels, anemia, hypertension, and diabetes.,,, As these risk factors overshadow aging and nonvascular factors, patients with CKD represent a potential model of accelerated vascular cognitive impairment. In this article, the disease-related and treatment-related neurological complications of renal disorders will be reviewed. With the introduction of dialysis and renal transplantation, the spectrum of neurological complications has changed. Dialytic therapy or kidney transplantation has also induced neurological complications. Dialysis dementia, dialysis dysequilibrium syndrome, hypertensive encephalopathy, and cerebrovascular accident caused by ultrafiltration-related arterial hypotension can occur as a direct consequence of dialysis. Furthermore, dialysis is associated with aggravation of atherosclerosis and can contribute to the development of Wernicke's encephalopathy, hemorrhagic stroke, subdural hematoma, osmotic myelinolysis, opportunistic infections, intracranial hypertension, and neuropathy. Neurological complications related to treatment of renal failure have a wide spectrum of manifestations [Table 1]. Manifestations of neurologic dysfunction may occur as a direct consequence of the uremic state, its treatment, or both. As therapeutic options for renal failure have grown, so has the spectrum of neurologic complications related to kidney transplantation and the use of immunosuppressant medications. Neurologic complications of renal failure can involve the CNS, PNS, or both. In patients with renal failure, encephalopathy is a common problem that may be caused by uremia, thiamine deficiency, dialysis, transplant rejection, hypertension, fluid and electrolyte disturbances, or drug toxicity. In general, encephalopathy presents with a symptom complex progressing from mild sensorium clouding to delirium and coma [Table 2]. Patients with CKD are at an increased risk of ischemic and hemorrhagic stroke. The magnitude of relative risk is estimated to be between four-folds and ten-folds when patients with CKD are compared to those without CKD. The risk of hemorrhagic stroke, including subdural, intraparenchymal, and subarachnoid hemorrhage, is increased in patients with renal disease. Qualitative platelet dysfunction with altered aggregability resulting from the uremic state leads to an increase in bleeding tendency. However, Krishna et al., studied a total of 1369 patients of CKD and concluded that, out of 1369 CKD patients studied in the 2-year period from December 2004 to December 2006, stroke was found to be more frequent in males and in the middle age groups. Hypertension, anemia, and diabetes were found to be important risk factors for stroke. Brain infarcts were more prevalent than brain hemorrhage. Active management improved the outcome in 62.9% of the patients. All those patients who succumbed developed hemorrhage, an observation that highlights the sinister significance of hemorrhage in CKD patients. Therefore, clinicians should have a high index of suspicion for CKD in stroke patients. Recent studies have described a graded, cross-sectional association between estimated glomerular filtration rate (eGFR) or proteinuria (albumin/creatinine ratio = 30 mcg/mg) and brief cognitive screening tests, tests of specific cognitive domains, or dementia.,, Longitudinal analyses have measured the relation between eGFR and dementia, or incident cognitive decline on the Modified Mini-Mental State (3MS) examination., None had measured the effect of eGFR on the rate of cognitive decline globally, using a detailed cognitive battery, and also the effect of eGFR within multiple cognitive domains. In the Rush Memory and Aging Project (n = 886 community-dwelling adults without dementia; mean age 80.6 years), a lower eGFR (eGFR = 60 mL/min/1.73 m2) or having CKD was associated with a rapid rate of global cognitive decline over approximately 3.4 years. Neurological infections in patients with renal failure mainly present as acute, subacute, or chronic meningitis, encephalitis, myelitis, or brain abscess., Opportunistic bacterial infections include pathogens such as Nocardia asteroides, Mycobacterium tuberculosis, and Listeria monocytogenes. Fungi are often represented by Cryptococcus neoformans, Aspergillus fumigatus, Candida, Pneumocystis carinii, Histoplasma, Mucor, and Paracoccidioides species. Reactivation of latent viral infection with herpes simplex, cytomegalovirus, and JC (John Cunnigham) polyomavirus are not uncommon., Infection with cytomegalovirus is the most frequent opportunistic infection following renal transplantation. It is usually asymptomatic; however, invasive forms with meningitis, encephalitis, myelitis, and involvement of nerve roots can develop. Reactivation of the JC polyomavirus and infection of oligodendrocytes results in progressive multifocal leukoencephalopathy. Action myoclonus and stimulus-sensitive myoclonus have been described in uremic encephalopathy. In addition, a “twitch-convulsive” syndrome consisting of intense asterixis and myoclonic jerks accompanied by fasciculations, muscle twitches, and seizures has been described. Restless leg syndrome occurs in approximately 15–20% of patients with CKD. Drug-induced involuntary movements in patients with chronic renal failure are more frequently seen in patients after a kidney transplantation. Neurotoxic effects of immunosuppressive agents such as cyclosporine and tacrolimus may manifest as tremors or as other extrapyramidal signs. Osmotic myelinolysis in patients with renal failure mainly occurs within the central basis pontis; however, extrapontine regions including the midbrain, thalamus, basal nuclei, and cerebellum can be affected as well. Osmotic myelinolysis after rapid correction of prolonged hyponatremia—or less frequent hypernatremia—by dialysis is a known problem. The peripheral nerves are susceptible to compression and local ischemia in patients with renal disease. The ulnar, median, and femoral nerves are most often affected. A compressive ulnar neuropathy in the Guyon canal can occur by uremic tumoral calcinosis at the wrist. A compressive median neuropathy at the wrist in the carpal tunnel is common. Clinical manifestations include weakness of the thenar groups with associated atrophy. Sensory symptoms include burning pain and paresthesias involving the ventral surface of the hand and the lateral three digits and the lateral border of the fourth digit. Thrombotic microangiopathy (TMA) is a well-recognized and a serious complication of renal transplantation. Renal ischemia by itself is an initiating event for the development of TMA. Prolonged ischemia is a proapoptotic factor and endothelial cells acquire procoagulant properties upon activation of apoptosis. The time from transplantation to diagnosis of TMA is variable; it has been reported to vary between a few days to years after transplantation, suggesting that different mechanisms are involved. TMA may occur de novo in the transplanted kidney without previous history of TMA as a cause of end-stage renal disease (ESRD). Calcineurin inhibitors, humoral (C4b positive) rejection, ischemia, and less frequently, viral infections, are all proposed etiological factors. The clinical presentation of posttransplantation TMA is variable; it often manifests clinically as the hemolytic uremic syndrome (HUS), with classical findings of renal failure, hemolytic anemia, schistocytes, and thrombocytopenia, with worsening renal function or delayed graft function (DGF). Literature review reveals a spectrum of TMA neuroimaging findings including parenchymal hematoma, posterior reversible encephalopathy syndrome (PRES), ischemic infarction, and venous thrombosis, with a case report also reporting multifocal hemorrhagic infarctions. 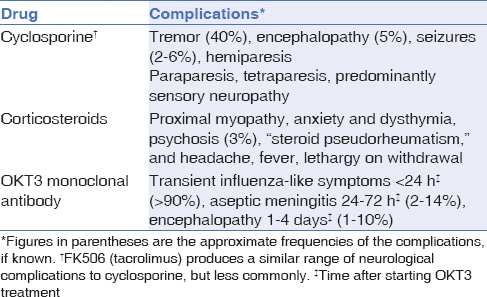 Side effects relating to immunosuppressive therapy, especially cyclosporine, are some of the most common neurological problems encountered in the transplant recipient [Table 3]. Some 15–40% of the patients receiving cyclosporine experience neurological side effects. Higher blood concentrations of cyclosporine are associated with an increased risk of complications, although the correlation is not a close one, and metabolites which are not assayed may also be important. More recently, a reversible posterior leukoencephalopathy syndrome has been described in a heterogeneous group of patients, including those undergoing renal, liver, and bone marrow transplantation and immunosuppressive treatment with either tacrolimus (FK506) or cyclosporine. Neurological complications have a major impact on the final outcome of patients with renal disorders. It is of paramount importance to vigilantly diagnose and manage such neurological complications in patients with renal disorders. Even with all the modern modalities of treatment, most of the neurological complications of dialysis fail to respond to dialysis and some are even aggravated after performing dialysis or transplantation. Krishnan AV, Kiernan MC. Neurological complications of chronic kidney disease. Nature Rev Neurol 2009;5:542-51. Kobayashi M, Hirawa N, Yatsu K, Kobayashi Y, Yamamoto Y, Saka S,et al. Relationship between silent brain infarction and chronic kidney disease. Nephrol Dial Transplant 2009;24:201-7. US Renal Data System. USRDS 2006 Annual Data Report: Atlas of Chronic Kidney Disease and End-Stage Renal Disease in the United States. Bethesda: National Institutes of Health, National Institute of Diabetes and Digestive and Kidney Diseases 2006. Ikram MA, Vernooij MW, Hofman A, Niessen WJ, van der LA, Breteler MM. Kidney function is related to cerebral small vessel disease. Stroke 2008;39:55-61. Murray AM. Cognitive impairment in the aging dialysis and chronic kidney disease populations: An occult burden. Adv Chronic Kidney Dis 2008;15:123-32. Brouns R, De Deyn PP. The complexity of neurobiological processes in acute ischemic stroke. Clin Neurol Neurosurg 2009;111:483-95. Barrett KM. Neurologic manifestations of acute and chronic renal disease. Continuum Lifelong Learning Neurol 2011;17:45-55. Riggs JE. Neurologic manifestations of fluid and electrolyte disturbances. Neurol Clin 1989;7:509Y523. Aminoff MJ. In: Raskin NH, editor. Neurology and General Medicine. Philadelphia: Churchill Livingstone; 1995. p. 303-19. Burn DJ, Bates D. Neurology and the kidney. J Neurol Neurosurg Psychiatry 1998;65:810-21. Ihara M, Ito T, Yanagihara C, Nishimura Y. Wernicke's encephalopathy associated with hemodialysis: Report of two cases and review of the literature. Clin Neurol Neurosurg 1999;101:118-21. Seliger SL, Gillen DL, Longstreth WT Jr, Kestenbaum B, Stehman-Breen CO. Elevated risk of stroke among patients with end-stage renal disease. Kidney Int 2003;64:603-9. Di Minno G, Martinez J, McKean ML, De La Rosa J, Burke JF, Murphy S. Platelet dysfunction in uremia. Multifaceted defect partially corrected by dialysis. Am J Med 1985;79:552-9. Krishna PR, Naresh S, Krishna GS, Lakshmi AY, Vengamma B, Kumar VS. Stroke in chronic kidney disease. Indian J Nephrol 2009;19:5-7. Barzilay JI, Fitzpatrick AL, Luchsinger J, Yasar S, Bernick C, Jenny NS,et al. Albuminuria and dementia in the elderly: A community study. Am J Kidney Dis 2008;52:216-26. Kurella TM, Wadley V, Yaffe K, Yaffe K, McClure LA, Howard G,et al. Kidney function and cognitive impairment in US adults: The Reasons for Geographic and Racial Differences in Stroke (REGARDS) study. Am J Kidney Dis 2008;52:227-34. Elias MF, Elias PK, Seliger SL, Narsipur SS, Dore GA, Robbins MA. Chronic kidney disease, creatinine and cognitive functioning. Nephrol Dial Transplant 2009;24:2446-52. Seliger SL, Siscovick DS, Stehman-Breen CO, Gillen DL, Fitzpatrick A, Bleyer A,et al. Moderate renal impairment and risk of dementia among older adults: The Cardiovascular Health Cognition Study. J Am Soc Nephrol 2004;15:1904-11. Kurella M, Chertow GM, Fried LF, Cummings SR, Harris T, Simonsick E,et al. Chronic kidney disease and cognitive impairment in the elderly: The health, aging, and body composition study. J Am Soc Nephrol 2005;16:2127-33. Bennett DA, Schneider JA, Buchman AS, Mendes de Leon C, Bienias JL, Wilson RS. The Rush Memory and Aging Project: Study design and baseline characteristics of the study cohort. Neuroepidemiology 2005;25:163-75. Barczyk MP, Lebkowski WJ, Mariak Z, Malyszko J, Mysliwiec M. Brain abscess as a rare complication in a hemodialysed patient. Med Sci Monit 2001;7:1329-33. Gupta SK, Manjunath-Prasad KS, Sharma BS, Khosla VK, Kak VK, Minz M,et al. Brain abscess in renal transplant recipients: Report of three cases. Surg Neurol 1997;48:284-7. Wong KM, Chak WL, Chan YH, Choi KS, Chau KF, Lee KC,et al. Subcutaneous nodules attributed to nocardiosis in a renal transplant recipient on tacrolimus therapy. Am J Nephrol 2000;20:138-41. Mrowka C, Heintz B, Weis J, Mayfrank L, Reul J, Sieberth HG. Isolated cerebral aspergilloma: Long-term survival of a renal transplant recipient. Clin Nephrol 1997;47:394-6. Bruno A, Adams Jr HP. Neurologic problems in renal transplant recipients. Neurol Clin 1988;6:305-25. Irie T, Kasai M, Abe N, Seto K, Naohara T, Kawamura K,et al. Cerebellar form of progressive multifocal leukoencephalopathy in a patient with chronic renal failure. Intern Med 1992;31:218-23. De Deyn PP, Saxena VK, Abts H, Borggreve F, D'Hooge R, Marescau B,et al. Clinical and pathophysiological aspects of neurological complications in renal failure. Acta Neurol Belg 1992;92:191Y-206. Mucsi I, Molnar MZ, Ambrus C, Szeifert L, Kovacs AZ, Zoller R,et al. Restless legs syndrome, insomnia and quality of life in patients on maintenance dialysis. Nephrol Dial Transplant 2005;20:571-7. Bechstein WO. Neurotoxicity of calcineurin inhibitors; impact and clinical management. Transplant Int 2000;13:313-26. Loo CS, Lim TO, Fan KS, Murad Z, Suleiman AB. Pontine myelinolysis following correction of hyponatremia. Med J Malaysia 1995;50:180-2. Garcia S, Cofan F, Combalia A, Campistol JM, Oppenheimer F, Ramón R. Compression of the ulnar nerve in Guyon's canal by uremic tumoral calcinosis. Arch Orthop Trauma Surg 2000;120:228-30. Dumitru D, Amato A, Zwarts M. Electrodiagnostic Medicine. Philadelphia: Hanley & Belfus; 2002. pp. 984-6. Babu MM, Kiran MR, Srinivas V, Kandregula P, Vardhan RV,et al. Clinical manifestation and prevalence of peripheral neuropathy and nerve dysfunction in patients with chronic kidney disease. Int J Res Med Sci 2015;3:451-5. Laaksonen S, Voipio-Pulkki L, Erkinjuntti M, Asola M, Falck B,et al. Does dialysis therapy improve autonomic and peripheral nervous system abnormalities in chronic uraemia? J Intern Med 2000;248:21-6. Hupperts RM, Leunissen KM, van Hooff JP, Lodder J. Recovery of uremic neuropathy after renal transplantation. Clin Neurol Neurosurg 1990;92:87-9. Okada H, Moriwaki K, Kanno Y, Sugahara S, Nakamoto H, Yoshizawa M,et al. Vitamin B6 supplementation can improve peripheral polyneuropathy in patients with chronic renal failure on high-flux haemodialysis and human recombinant erythropoietin. Nephrol Dial Transplant 2000;15:1410-3. Kuwabara S, Nakazawa R, Azuma N, Suzuki M, Miyajima K, Fukutake T,et al. Intravenous methylcobalamin treatment for uremic and diabetic neuropathy in chronic hemodialysis patients. Intern Med 1999;38:472-5. Campistol JM. Uremic myopathy. Kidney Int 2002;62:1901-13. Moore GE, Parsons DB, Stray-Gundersen J, Painter PL, Brinker KR, Mitchell JH. Uremic myopathy limits aerobic capacity in hemodialysis patients. Am J Kidney Dis 1993;22:267-87. Kunis CL, Markowitz GS, Liu-Jarin X, Fisher PE, Frei GL, D'Agati VD. Painful myopathy and end-stage renal disease. Am J Kidney Dis 2001;37:1098-104. Fahal IH, Bell GM, Bone JM, Edwards RH. Physiological abnormalities of skeletal muscle in dialysis patients. Nephrol DialTransplant 1997;12:119-27. Ardalan MR. Review of thrombotic microangiopathy (TMA), and post-renal transplant TMA. Saudi J Kidney Dis Transpl 2006;17:235-44. Cailhier JF, Nolin L, Hebert MJ. Thrombotic microangiopathy following renal ischemia and revascularization: Apoptosis of endothelial cells in action. Nephrol Dial Transplant 2001;16;1725-6. Pham PT, Danovitch GM, Wilkinson AH, Gritsch HA, Pham PC, Eric TM,et al. Inhibitors of ADAMTS13: A potential factor in the cause of thrombotic microangiopathy in a renal allograft recipient. Transplantation 2002;74:1077-80. Ellchuk TN, Shah LM, Hewlett RH, Osborn AG. Suspicious neuroimaging pattern of thrombotic microangiopathy. AJNR Am J Neuroradiol Apr 2011;32:734-8. Patchell RA. Neurological complications of organ transplantation. Ann Neurol 1994;36:688-703. Hinchey J, Chaves C, Appignani B, Breen J, Pao L, Wang A,et al. A reversible posterior leukoencephalopathy syndrome. N Engl J Med 1996;334:494-500.